This chapter addresses the medical presentation, histology, biological features, risk stratification, and surgical management of malignant adrenal disease. 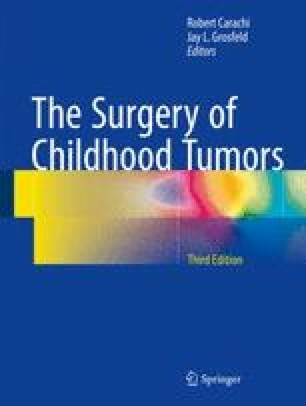 Neuroblastoma is the most common adrenal neoplasm in the pediatric population, accounting for 97 % of adrenal neoplasms in children younger than 15 months. It is 50 times more common than pheochromocytoma, the next most common tumor. The good prognosis associated with early-stage, biologically favorable disease, with a survival rate of more than 90 %, stands in dramatic contradistinction to the poor prognosis associated with metastatic or biologically unfavorable presentations. Treatment is typically determined by the risk stratification schemes of the Children’s Oncology Group, the International Neuroblastoma Staging System, and the International Neuroblastoma Research Group.